We released My IP Hide 1.03 on Sept 9, 2012. It starts to support both Windows and Mac. All the Mac users using the version Mac OS X 10.5 and later can download and try it. We recommend all users updating to the latest version. It includes these changes. 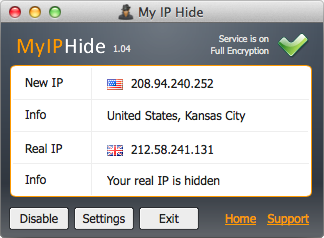 My IP Hide is the client-end software of our encrypted proxy service. It can help you to unblock websites and protect your Internet privacy. Unblock websites: In some companies or countries (ex. China, Egypt and Iran) the management blocks some websites (ex. facebook and youtube). My IP Hide can unblock the sites. It uses encrypted connections to bypass the firewall as well as content filtering system while ordinary proxy can only bypass IP/domain block. Internet privacy: Websites know much information through your IP address. For example, from your IP we can know your country. My IP Hide can hide your IP to protect your Internet privacy. Unblock facebook: Facebook is blocked in your company or country? My IP Hide is a secure facebook proxy. It uses encrypted connections to unblock facebook. It can bypass the advanced firwall while ordinary proxy can only bypass IP/domain block. Unblock youtube: Youtube is blocked in your company or country? My IP Hide is a fast youtube proxy. It uses fast encryption to unblock youtube. It is much faster than VPN or SSH proxy. You can watch youtube smoothly with our service. We released My IP Hide on May 31, 2012. It includes many improvements. We recommend all users updating to the latest version. It includes these changes. 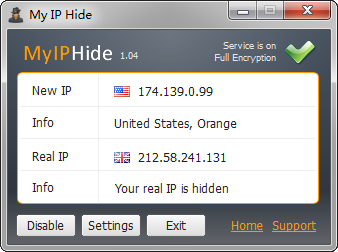 My IP Hide is the client-end software of our encrypted proxy service. It can help you to unblock websites and protect your Internet privacy privacy. Internet privacy: Websites know much information through your IP address. For example, from your IP we know your country. My IP Hide can hide your IP to protect your Internet privacy. Does DNS Test Leak My Real IP Address? How to use My IP Hide in iPhone? What Program Changed Proxy Settings? You can get this IP address widget for your site too. It also has a wordpress version.